I’m a mom…who works...who writes…who cooks…who cleans…who sings in an acoustic duo…who reads about thirty-five books per year…who has to make time for everything in between. You get the picture. I’m busy. And I will bet that your plate is just as full (so thank you for taking a few minutes out of your day to read this). For busy bees like us, it is essential to keep our days somewhat structured, right? But what is the best way to do that? For me, it’s using an efficient online calendar. I know, I know. This is not earth-shattering news, nor am I reinventing the wheel. But when I find something that works for me, I like to share it. Enter KeepandShare.com. With a multitude of online calendars to choose from, it took me quite a bit of time to find the one that best tames the circus that is my life. 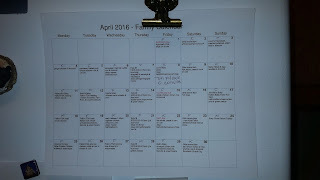 The feature that sealed the deal for me is the free-form writing that is available for every calendar date. Maybe it’s the writer in me, but I’m not a fan of calendars that make you choose a time to set up a meeting/appointment (but Keep and Share also offers this type of set up if needed). Outside of my full-time job, my life doesn’t run that way. I don’t hold meetings with my kids. I don’t make appointments to visit the grocery store. Keep and Share has enabled me to sort out my day at my own pace. As a mom, having a calendar that simply allows me to write my to-do list without those annoying meeting reminders is valuable for both my organizational management and my sanity. Another great feature is that Keep and Share makes it simple to share your calendar with others who have Keep and Share accounts. Need your husband to get some milk after work? Add it to your family calendar where you both have access to the tasks that need to be completed for the day! Need a document ready for work? Add it to your work calendar so your colleagues can see it! You can even share the document with your team in the "Files" section! In addition to my favorite features, Keep and Share calendars can be imported or exported, and are also available on your smartphones with the Keep and Share app. And as far as costs go, there are several paid calendar options to choose from, but I opted for the Keep and Share free package, which allows up to 5 separate calendars and 500 calendar entries. This is more than enough, even for this busy mom! Keepandshare.com is the secret weapon I use to make juggling life look easy. So, go ahead and give it a try!